As I came into the picnic area awning, volunteers and other runners’ crews yelled and rang cowbells. I felt a little stiff and my right foot was definitely forming a giant blister on the ball, but still in good spirits. I sat down on the bench of a picnic table as a volunteer walked over with my drop bag. V: What’ll you have? Pringles? PBJ? Ramen? I opened my bag and pulled out a The North Face jacket. Then created a pile with it including my gloves, pants, beanie, headlamp, and a fresh shirt. For some reason, I thought it would be a good idea to put my pants on in the bathroom. I mean, I had compression shorts on, so not like it would be inappropriate or anything, but thought it might be better. Then I can also work on the anti-chaffing strategy. Well, the closest bathroom was a porta potty about 200 feet away. 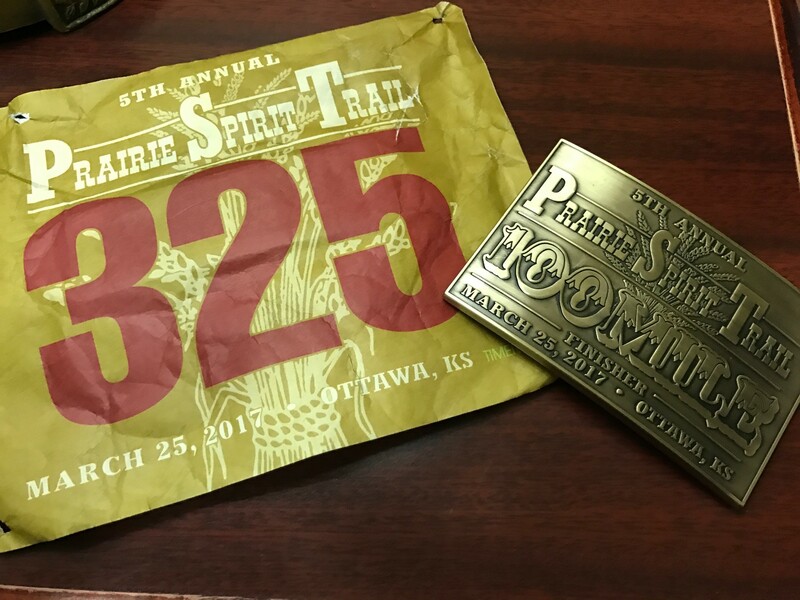 Sure, that doesn’t sound far, but after 50 miles with hips stiffening up and feeling like you have a foot on fire, it’s a slow travel where the distance doesn’t count towards the race. As you might imagine, a porta potty is not very large, so putting on pants didn’t happen there with me no longer being very flexible. 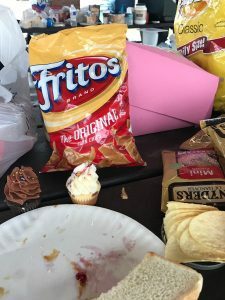 I headed back to the picnic area where there was more room and I could snack while waiting. 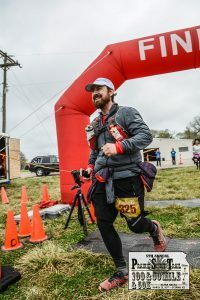 If you want some amusement, head to an ultramarathon and after the 50 mile mark, as runners to do basic tasks like touch their toes, spin around 3 times, or putting on pants. I did a pretty good job getting both feet into the pant legs, but that was about it. Lady: Hey let me help you with your pants there! Seriously, the crew and volunteers at this race are awesome! Me: Thanks. Just not moving in every direction very well. Lady: Can I get you anything else? Me: Some more Coke would be great. Then I turned around to my stash of food and found several mini cupcakes sitting next to them. Not sure where the Cupcake Fairy came from, but would like to give them a giant hug. Good Lord did those hit the spot! Instant calories and sugar rush got me up and ready to go on. After shoveling more Pringles in my mouth and grabbing another cupcake, it was time to start running home. Off across the street and up the sidewalk. As I was heading up, the guy that gave me a ride at mile 61 last year was coming into the aid station. He was looking pretty out of it, but I stopped and gave him some encouraging words to get to the aid station and eat. He still had plenty of time to turn it around. Sometimes, that’s all you have to go on in these long races. They are long which means lots can happen. On the way out to Iola, the trail seemed uphill. Now, not uphill in the sense that Leadville is gathering 1,000s of feet in elevation, but there was an ever so slight incline. I was looking forward to the trip back down the slight incline. Around mile 58, the sun was disappearing over the farmers’ fields. It was quite poetic. The only thing really going through my mind was that there was zero chance I was ending my race at the next aid station. That is what happened last year, but this year was different. I jogged into the aid station and found my same spot from 20 miles ago. The rain seemed to have stopped for the night, so that was a good sign. Me: Hey! You’re the one that helped pull up my pants! I might have basically yelled that. 2nd part of mantra: Laugh. She remembered me and laughed. Then the rest of the crew gathered. Me: How about some whiskey? Oh you have found the right crew! I think we need to adopt you as our runner! There was no chance that I was stopping at this aid station. This is where I stopped last year and knew that once I went on from here, by the next aid station I would have passed my farthest distance ever of 64 miles. 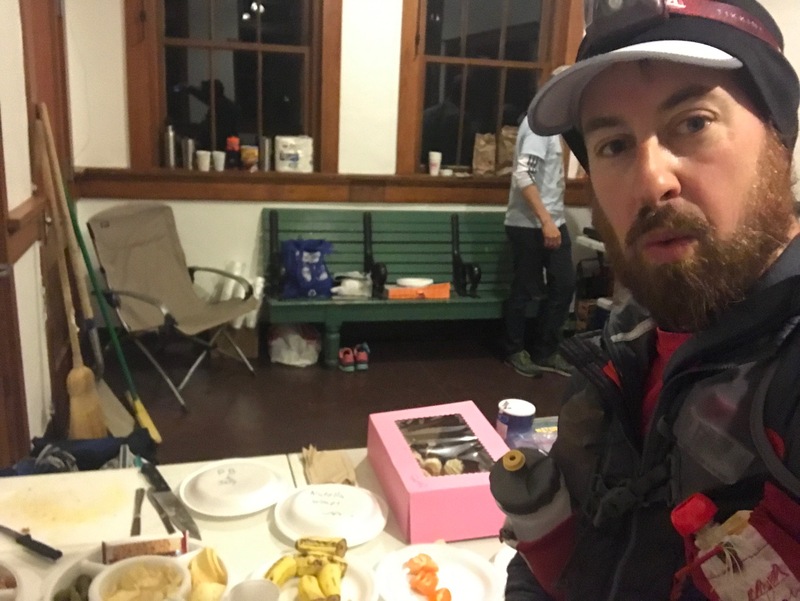 My newly adopted crew brought me some hot ramen to chow on while I checked on my feet and put on fresh socks. V: You should come into the tent by the heater. Me: Ummm … that’ll make it harder to get up and leave. I did make my way to the tent as that’s where more food and Coke were. It was definitely more comfortable in there. Huddled around the heater were 3 guys that weren’t saying much. It seemed by the looks on their faces their race was done. That was enough motivation to get me moving on. I said my thanks to the incredible volunteers and started down the trail. Around mile 63, I came up on another runner. It was nice to see another person out here in the dark Kansas landscape. Me: Hey there. No pacer either? A: No pacer no crew. And so we ran together and talked about family, work, running, and more about family. She pushed me when I didn’t want to run and vice versa. God brings people into our lives at certain times and knew already He delivered a lightning bolt on this occasion. This is the aid station that takes you down a gravel driveway. Me: Hey … I think I ran into this aid station with you on the way! A: I think you’re right! There were a few cars idling in the parking lot. I bet it was warm in those vehicles. 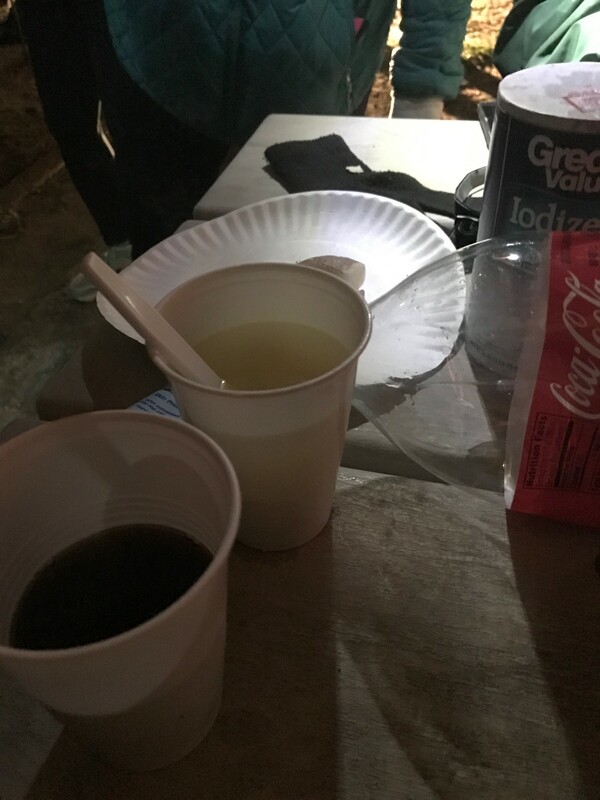 Rather than be pulled in by the comforts of the aid station, I headed to the picnic table to pour me a Coke. Crew: Here comes our runner! Me: ‘runner’ is a loose term at this point. Do you have Ibuprofen by any chance? Crew: We have a whole pain medication kit! She walked away and I started to sip on some Coke to help wake up. What she came back with, changed my race. She laid down on the table a clear box that was probably designed for fly fishing. It had individual compartments containing a variety of items. Crew: What will you have? We have Ibuprofen, Tylenol, Motrin. My eye went to the bottom left 2 compartments. Crew: Fireball whiskey! Want one? Me: Woah … I’m about 25 miles away from finishing this thing. How about at the finish line? Crew: You got it! It’ll be waiting for you there! 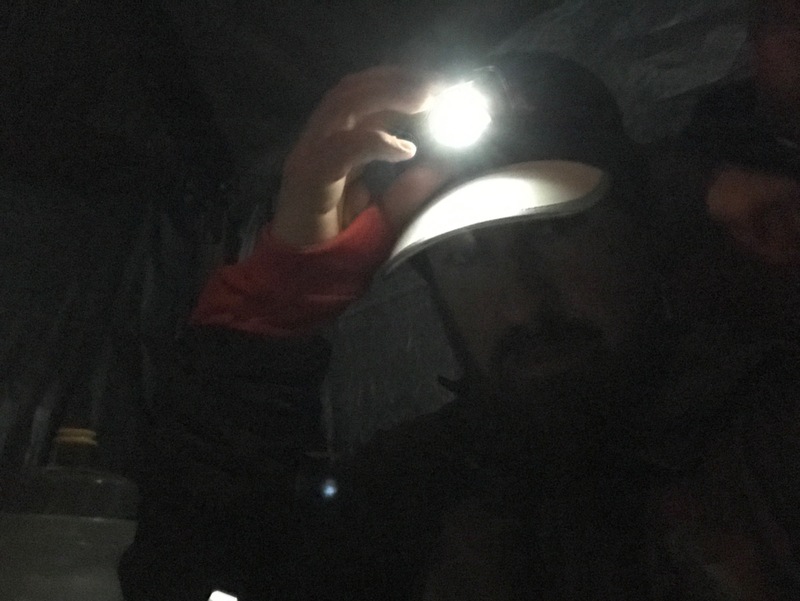 I wandered over to the tent and grabbed some Nutella wraps while A was packing up a snack bag of pretzels, M&Ms, and other goodies. We were ready to hit the trail again! Along the trail towards the outskirts of town, there was something weird about 50 yards in front of us. A: It looks like there’s a dancing frog up ahead? Me: What the hell is that? Is that a reflector on someone’s water pack? A: He looks like he’s dancing a jig side-to-side. Me: It certainly is not an efficient way to the finish line. We caught up to the runner and it was the guy in a green kilt that I had chatted with about 40 miles ago. He had a glass-eyed look and mumbled out some words. We tried to stay with him for a little bit, but he wasn’t making much progress. 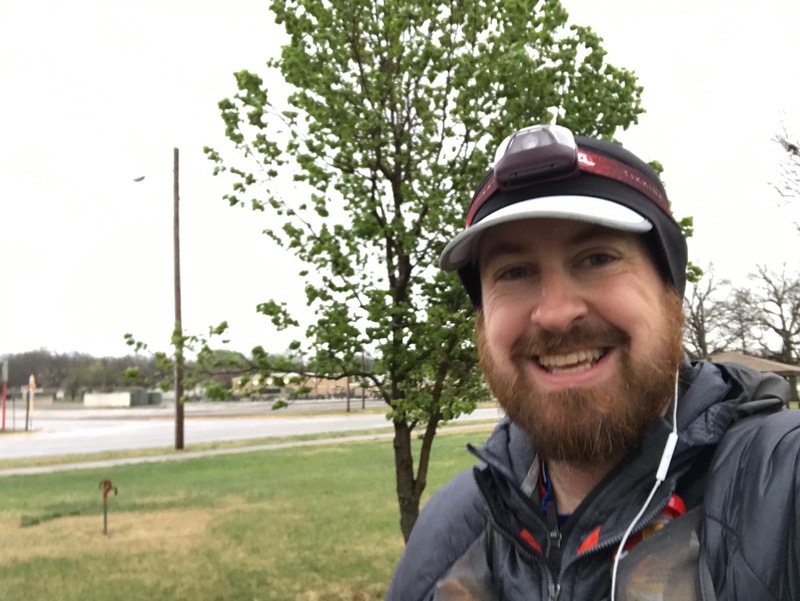 I wanted to take advantage of the Ibuprofen feeling and keep moving ahead. It’s a little scary out there if you get close to the sides of the trail. At some places they drop quite steeply and the dry trees would probably stab you on the way down. Then my brain starts to wander and think about how long it would take for someone to find me on the side of the trail should I be out here alone and go down. Back to happy thoughts! At this point, it’s about 1am and the trail feels like a tunnel covered with trees. Headlamps were allowing us to see maybe 10-20 feet ahead of us. This is Kansas dark with not a street light for miles. Me: That looks like a family with signs up ahead. Me: No, really. Look up there on the left. I was losing it. Needed more sugar to stay awake or sip on some coffee or something. Wow that was a long blink … I’m not sure if I fell asleep while moving or how much time just passed. Need to make it to sunrise and then it’s a whole new day. Literally. I really like this aid station. It’s a combination of the awesome volunteers and that it’s inside an old train station. Oh and they have real working bathrooms. That’s a nice plus. First thing I did was head right over to the train station bench right in front of the table of food. Look more cupcakes!!! Enjoyed some Coke, ate more PBJ, and crunched plenty of chips. I took the opportunity to use a real working bathroom and take care of some chaffing. Sitting back by the food, I took a photo to text to my family and post online. I started posting after mile 51 because I was feeling a little more confident. Some post online as a way of holding themselves accountable. I’ve not found that works great for me as I almost prefer doing the opposite. I guess that’s why running 100 miles doesn’t sound completely insane to me. 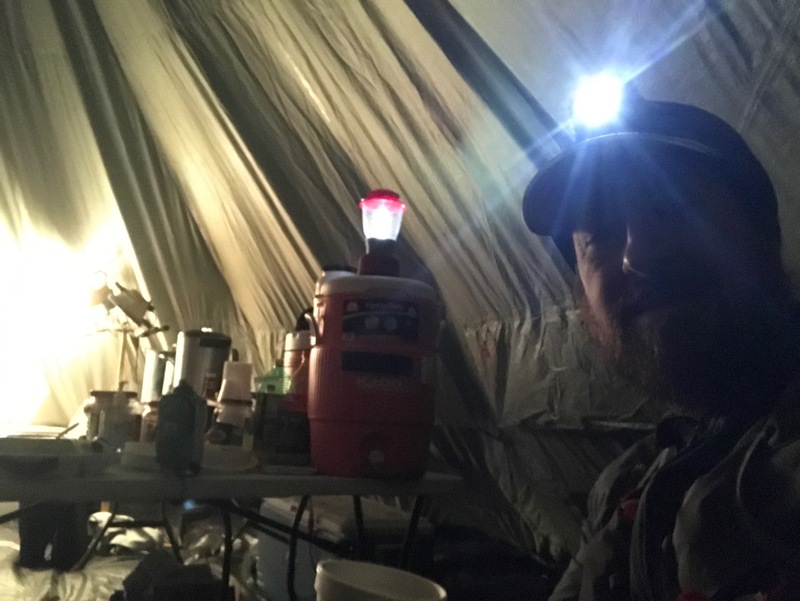 By the door, I stared at the sign that said 8.5 miles until the next aid station with cutoff time at 7am. It’s 2:50am now, that gives us 4 hours to go 8.5 miles before cutoff. At the rate we are going, that will take about 2 hours. So 4 hours minus 2 hours gives about a 2 hour buffer. A: Are you okay? You look really concerned. Me: I’m doing basic math, but we’re good now. We headed out of the train station heading through town. This was the last of civilization we would see for at least 2 hours. It was about 3am and my blinking was turning into semi-sleep running. A: You know, you can’t trust a fart. A: It could always be something else other than a fart and then you have a real problem. Me: Especially out here in the middle of Kansas at 3am. These are the things that weigh on runners’ minds. Me: That moon looks really weird up ahead. Me: The moon. It’s weird. I haven’t seen that shape before and it’s really low. Don’t try anything new on race day. Right. That advice makes great sense to a point. When you’re going to be doing something for up to 30 hours, you have time to recover should something go wrong. Aside from my running mate’s charming personality, positivity, and incredible drive, she also packed a drop bag for every aid station. I had been complaining about my foot for a few miles now and upon looking at them, I could see why. It was like all the skin from the ball of my foot had pushed up under my toes and was holding in a ton of liquid. Again, if you’re in a medical profession, skip this next part. I took my safety pin off my bib and proceeded to drain it. I got a few good oohs and ahhs from those in the tent. A: I have some moleskin you could put on that which may help. V: It’s like adding a piece of skin on top of yours and it falls off in a couple days. Me: But how does it actually work? This seemed to cause a bit of a debate in the tent. I took the moleskin, a glorified adhesive pad, and patted it onto the ball of my foot. If anything, I could tell myself it was working. V: You want a cheeseburger slider? I posted my update that I was eating and treating my feet, then off we went. V: Hey how you feeling?!?! V: That’s fair. You look great! I went into the tent and sat in a nice comfy beach chair. Maybe too comfy as I was already wondering how I was going to get out of the chair. I posted a photo of me eating some bad frozen pizza with the caption “Mile 93 aid station. All that is left is the finish line.” Looking at that photo now is a little freaky. I really looked out of it! After A had her pizza and I had more Coke, it was time to finish this thing up. Except at the pace we were moving, that meant a couple more hours. As I was leaving the aid station, I checked Facebook. People were already congratulating me on an awesome job and way to go. Ummmm … I hadn’t finished yet. It’s not over until I cross that finish line. Granted, I had 4 hours to get there, but who knows if I was going to pass out in a mile or so. Mild panic attack of trying to explain why I couldn’t finish the last 7 miles. Let’s get moving! Slowly. The next 7 miles was a combination of silent running, random jokes, and my foot felt like I was running on a water balloon. That was going to be an issue later, but run through it. We came off the crushed gravel trail to the greetings of a Park Ranger. Ranger: Congrats! 2 miles of pavement until the finish line! Ranger: I can take a photo of the 2 of you for our trail website? This kind of enthusiasm makes a huge difference. You always hear the saying that a smile can turn a person’s day around. After running 98 miles and having the energy drained from you to where you are running on fumes, a simple hello from a stranger is fuel. It may allow someone to push on for another mile or enough to finish the race. A simple act of kindness that costs someone nothing but 4 seconds of their time. The last mile is definitely the hardest. You can see the finish line, but you have to do this wavy s-trail and then slight uphill on pavement to get there. It was like a mirage and I wasn’t getting any closer. You couldn’t wipe the smile off of my face. Even jogging it in suddenly didn’t hurt one bit. It was starting to hit me that I had been awake for over 28 hours and traveled 100 miles. Lisa was there taking video and Stephen had come back to see me finish. My adopted crew was there waiting for me with that little bottle of Fireball Whiskey as promised. It was a movie-style ending. 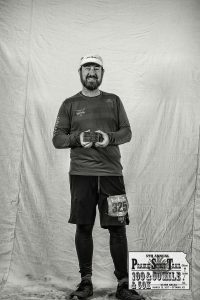 Post-race, I got my finisher’s photo taken with the buckle and headed over to place my breakfast order. There were bacon pancakes, hashbrowns, and more stuff that I didn’t really hear. My stomach was not really in the mood for eating that much anyhow. 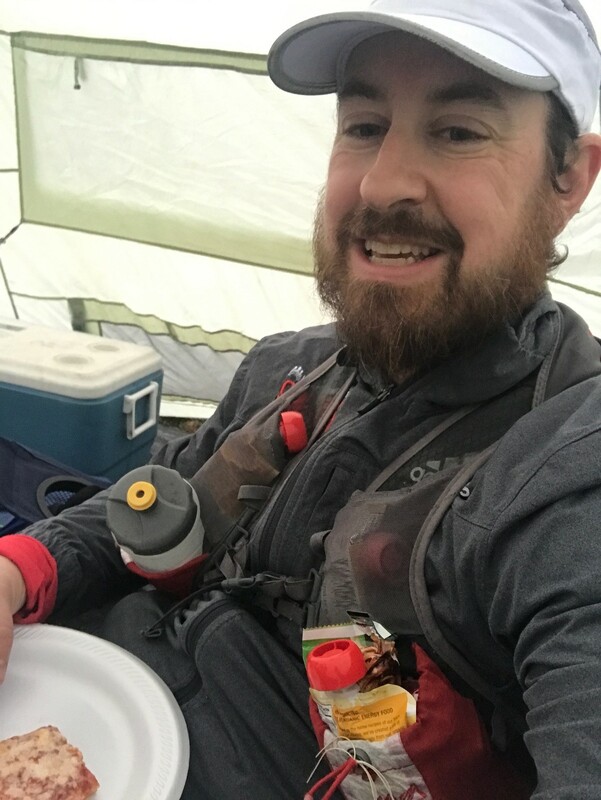 Then I did a video chat with my wife and 4 kids who were super excited about me finishing and being in really good condition considering what I just did. My energy was quickly draining now that my body was starting to realize I was really done. I felt bad I couldn’t reply with the same enthusiasm as they were. They were noticing I may need to go take a nap and shower so they let me go do that. Before leaving, I went over and gave A big hug. I’m not sure how long it would have taken me if we hadn’t run together. There’s even a good chance I may not have made it to the finish line. I truly made a lifelong friend. I hobbled to my rental car, fell into it, and extra carefully drove back to the hotel. In my head, I ran through the scenarios of what I would say if I was pulled over by the police. There’s almost no chance I could walk a straight line one foot in front of the other. Touch my nose? Probably not. Fortunately, my hotel was 2 miles away. You won’t believe this, but I made my way up to the 2nd floor where my room was, and MY KEY DIDN’T WORK! Oh you have got to be kidding me. I turned around and laughed. Delusional much. I hobbled back down the stairs, around the building to the lobby, and entered. Me: My key doesn’t work. Desk Guy: Oh I am so sorry about that. Let me get it fixed. Me: I’m not walking so well. Desk Guy: I see that and I am really sorry about your key. Shower, 2 hour nap, and a trip to Freddie’s for a cheeseburger, fries, and milkshake rounded out the afternoon.